Primary Natural Resources copper, cobalt, hydropower. 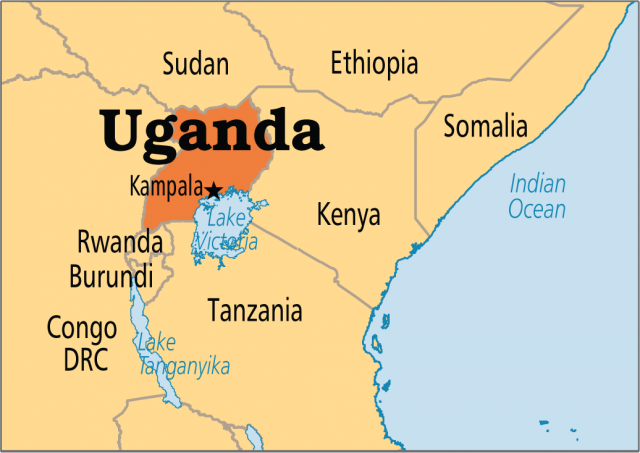 UGANDA IS A LANDLOCKED east-central African country bounded by TANZANIA and RWANDA on the south, CONGO (formerly Zaire) on the west, SUDAN to the north, and KENYA to the east. It is situated on a fertile plateau in the center of which is Lake Kyoga. The plateau extends to the Great Rift Valley, with Lakes Albert and Edward on the west, the RUWENZORI and Virunga mountains on the southwest, and Lake Victoria on the south. Bantu-speaking peoples apparently first migrated into the area more than 2,500 years ago. By the 1300s, three kingdoms had emerged: Bunyoro, Ankole, and Buganda. During the 1700s, Buganda began to expand and raid the others for cattle, ivory, and slaves. By the 1840s, Buganda had made contact with Arab traders who provided firearms, cloth, and beads for ivory and slaves. In 1862, John Hanning Speke, a British explorer searching for the source of the NILE, became the first recorded European to visit Buganda. He met with King Mutesa I, as did Henry M. Stanley in 1875. Stanley convinced Mutesa to allow missionaries to enter his realm. In 1884, Mutesa was succeeded by King Mwanga, who began to persecute Christians and was deposed. He regained the throne in 1889, only to lose it again within weeks. In early 1890, he regained it again and signed a treaty of friendship with GERMANY. That alarmed Britain, which secured a treaty with Germany that gave the UNITED KINGDOM rights to the area. Frederick Lugard of the Imperial British East Africa Company arrived with British troops and in 1894 the United Kingdom officially made Uganda a protectorate. The British introduced cultivation of cotton, which became the major export crop. Coffee and sugar production began in the 1920s; however, the area attracted few permanent European settlers. Instead, Asians primarily from iNDIA, PAKISTAN, and the former Portuguese colony of Goa began playing a leading role in commerce. On October 9, 1962, Uganda became independent, with Milton Obote as head of state. He was deposed in January 1971 by Idi Amin, who ordered 60,000 Asians to leave. Since they had played a significant role in Ugandan business and finance, their expulsion crippled Uganda’s economy. Amin’s rule was eccentric and brutal with an estimated 300,000 Ugandans killed during the 1970s. He aligned the nation with radical causes, leading to such public embarrassments as Israel’s successful raid on the Entebbe airport in 1976 to rescue airplane passengers hijacked by Palestinians. In 1976, Amin declared himself president for life and attempted to annex western Kenya and the Kagera region of Tanzania. That led to a series of military defeats and Amin fleeing into exile in SAUDI ARABIA, where he died in 2001. Obote returned to power, but civil war followed with approximately 200,000 Ugandans seeking refuge in neighboring Rwanda, Congo, and Sudan and a reported 100,000 Ugandans reported killed. In 1985, a military coup deposed Obote but the National Resistance Army, an anti-Obote group led by Yoweri Museveni, kept fighting after it was excluded from the new government. It seized control on January 29, 1986, and Museveni was declared president. A ban on political parties was lifted in 1996 and Museveni won 72 percent of the vote thanks to the country’s economic recovery. Agriculture is the most important sector of the economy, employing over 80 percent of the work force. Coffee accounts for the bulk of export revenues. Ethnic Bantus account for 67 percent of the population, East Nilotics, 12 percent; Western Nilotics, 15 percent; and the Central Sudanic, less than 5 percent. Christians account for 70 percent of the populationand 28 percent are Protestant.